Now it's time to test our shiny new native Android app in the emulator. 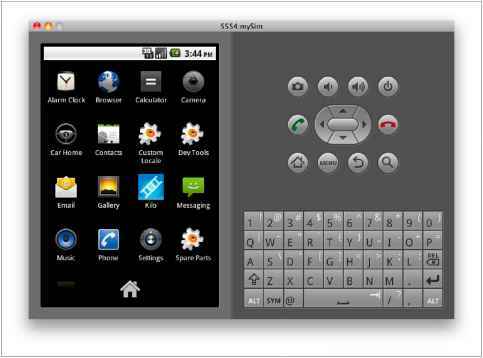 You should see the Android emulator window appear after a few seconds. Notice that the command prompt doesn't return in the terminal window—it will sort of just sit there and hang until you close the emulator. We won't be interacting with this window, so you can minimize it to get it out of the way. If all goes well, you'll see a stream of output with BUILD SUCCESSFUL at the end (Figure 7-10). A binary executable named Kilo-debug.apk will now be sitting in the ~/Desktop/KiloGap/bin directory (Figure 7-11). If the build is not successful, repeat the steps in "Build KiloGap" on page 118. [echo] Creating output directories if needed,,. [echo] Generating R.java / Manifest,java from the resources,,. [echo] Compiling aidl files into Java classes,..
[echo] Fackaging resources [aaptexec] Creating full resource package,..
"adb" is short for Android Debug Bridge, which is a tool that is included in the Android SDK we installed earlier in the chapter. The -e flag tells adb to install our binary package (i.e., ~/Desktop/KiloGap/bin/Kilo-debug.apk) on the first running emulator that it finds. The -r flag tells adb to replace the binary on the emulator if it has been installed previously. If you get a "device offline" error, go into the emulator and unlock it if it's locked (for example, on Android 2.2, slide the green lock icon to the right), then try again. Your app is now available on the emulator just like any other application (Figure 7-12). To play around with it, locate Kilo in the application launcher and tap it to launch the app. You'll notice right away that there is a bit of cleanup to do. For example, there is an approximately 40px gap at the bottom of the window (Figure 7-13). 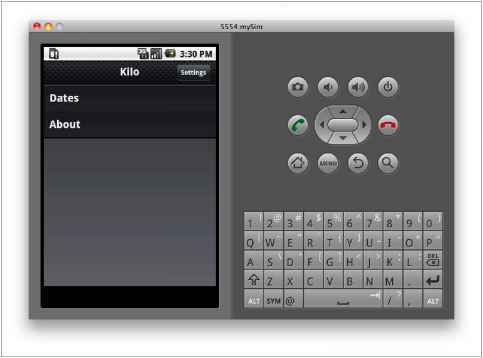 How to Installing KiloGap in the Emulator for android?